Following a period of development, we are pleased to announce the availability of a new range of vacuum brake ejectors. These new ejectors, engineered in the UK are exclusively available from Polly. We hope to have stock in time for the Harrogate exhibition. Polly are pleased to announce a collaboration agreement with Ken Swan, whereby we will distribute castings and drawings for his popular locomotive models. Most importantly the agreement will see Six Coupled Koppel tank loco design completed with drawings, castings, laser cut parts, etc available from Polly. Visitors to recent exhibitions will have had a sneak preview of our new saddle tank loco. We can now announce that development of the model is complete and customer enquiries for this exciting new model are welcome. Inspired by the full size Trojan, based at the Didcot Railway Centre, our kit built model is not a fine scale model, although it captures the character of the full size loco and incorporates much of the detail. The model thus sits comfortably between our traditional kit built models and our fine scale models. It will appeal to novice builders, seeking a reliable, easy to build loco with the appearance of a scale model. For many years Polly have supplied stainless steel superheater elements manufactured for us by PGTS. Following retirement of the manufacturer, we acquired the rights to take over the manufacture of these items and will continue to supply the same high quality stainless steel superheater elements in a wide variety of sizes, including some specific to particular loco designs. We are pleased to announce the availability of a full set of drawings for this delightful loco. Sadly Neville Evans the designer died shortly before the first model was completed, however using his working drawings we have completed the set of 11 A1 drawings and it is planned that a final description of the loco will appear in Model Engineer in the near future. With all major castings available, together with a range of laser cut parts and our famous CNC and drilled platework to reduce the donkey work, this is an ideal loco for the builder seeking a well detailed small tank engine. Once again Polly attended this major exhibition held in this impressive exhbition hall. Despite the severe weather conditions, we were pleased to see the number of visitors and to meet up with our many friends and customers. Once again the Polly Owners Group added much to the exhibition running a portable track demonstrating the enjoyment they gain from they models and giving rides to visitors. Our next exhibition will be the Northern Modelling Exhibition at Manchester 2nd - 3rd March. Recently John Lopez of the Nottingham SMEE has developed an innovative signal lever frame system which has been implemented on the societies tracks at Ruddington. Polly are pleased to have been able to support in organising the many laser cut components required for the levers, latches, frame plates, etc. The development has now been published in Engineering in Miniature magazine and Polly are making parts available as per John's design. Guide price for lever frames is Â£10 per lever plus VAT. Polly locos were displayed to a new audience at the recent major event, Railfest at the York museum. A full line up of POLLY locos was displayed in a marquee adjacent to the tracks on which celebrity locos including Hardwick and the LNWR coal tank were displayed. With Flying Scotsman and Tornado nearby, the Polly locos were in the best of company and many folk were made aware of how our simple to build kit locos can provide a way in to the model engineering hobby..
Neville Evans designer of Penrhos Grange and a number of other miniature locomotives, died earlier this year. As a tribute to him, we will have a special display at the Model Engineer Exhibition at Sandown Park. 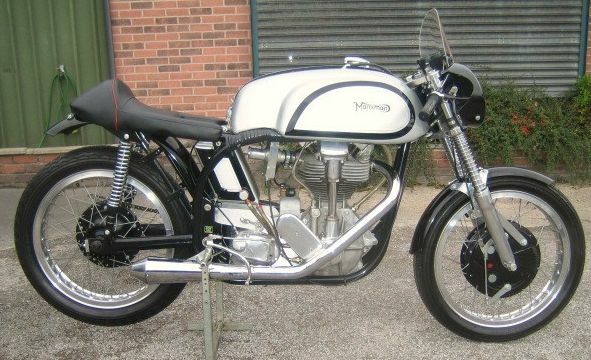 The display will feature a full size Manxman 500 motorcycle one of 54 Manx Norton derived bikes designed and developed by Neville Evans. During the course of the exhibition, Pete Thomas will also present a tribute lecture. With new patterns made for some parts, the major castings for the cylinders and wheels of the Dean & Armstrong locos by Pete Rich are now available. Cylinder end caps for the Castle are also now available together with the lost wax cast loco horns and Dean buffer stocks. GWR Collett 4000 gal Tenders in 7 1/4 gauge ! Our range of 5" gauge tenders, including the GWR Churchard 3500 gal and the later Collett 3500 and 4000 gal types have proved extremely popular. The introduction of the very fine scale Churchward 3500 in 7 1/4 gauge to run behind the Collett goods (and many other engines! ), proved equally popular. We are now pleased to advise that following customer requests, we have introduced a tender fit for a king in the 4000 gallon Collett tender tank which is now available for 7 1/4 gauge. CNC cut, drilled and formed parts for the tank make for easy and accurate assembly and the result can stand proudly alongside the work of expert craftsmen. New Polly Loco added to the range! The new Suzanne 0-6-0 tank loco is a logical development of the popular Caroline 0-4-0 Koppel tank loco. With the prototype seen at this year's Midlands Model Engineering exhibition at Leamington, this model is destined become another hit for Polly. With proven mechanical parts and simple assembly of a genuine fully machined kit, the new loco should appeal to those wanting a sligtly larger and heavier loco, especially where they are not constrained by very sharp curves of a garden railway. A prominent feature of all GWR outside cylinder locomotives. These valves rather akin to a small safety valve are an essential feature of piston valve engines, but something of a fiddle to make. These miniature valves are now available from stock for 5" gauge locos and planned for 7 1/4" gauge too. GWR Fittings - Injector Steam Valves! This month sees the introduction of long awaited fine scale GWR injector steam valves. With tufnol handles, these valves are available for both 5" and 7 1/4" gauge locos. The 7 1/4" gauge valves have of course been developed for the GWR Collett Goods but due to GWR standardisation they are equally applicable to other classes. The 5" gauge valves are of course suitable for Penrhos Grange or any other 5" GWR model. The Directors of Polly Model Engineering Limited are pleased to announce that the company is moving with effect from 1st November 2010. Despite the economic conditions, the company has seen growth in all areas of its business and has outgrown its accommodation. 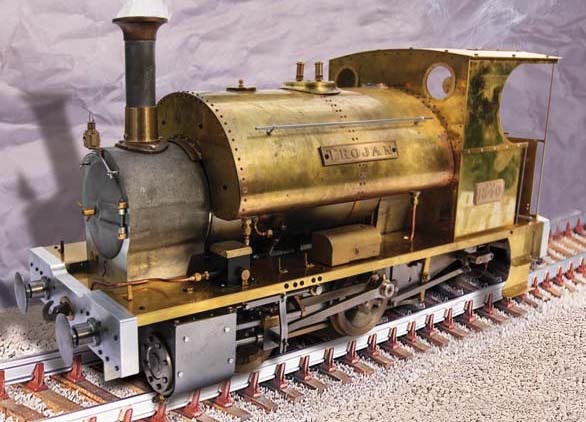 Polly locos have never been more popular, model engineers’ supplies and stationary engine kit sales keep growing and the developing range of fine scale loco models is now a significant part of the business. Polly, under the leadership of Andy Clarke, has traded from its Bridge Street premises since 2000, progressively taking on more space with the incorporation of the model engineers’ supplies business, Bruce Engineering, in 2003, investment in CNC machinery and the development of a comprehensive product range including some very fine scale models. The new premises, approximately 3 times the size of the existing premises, will provide space to accommodate the wide range of CNC and other machinery and there is plenty of space to organise the large and varied stock held. The premises are only a short distance from the existing site and just a few hundred yards from Long Eaton Railway Station. Visitors are welcome at the shop, Mon – Fri 9:00 – 16:45 and by appointment on Saturday mornings. Cold chemical blackening for iron and steel. Please use the link below to see the flyer for more details. Note: We regret due to carriers' restrictions that we are unable to ship Black-It to overseas customers. Wide range of Ãƒï¿½Ã‚Â¯Ãƒï¿½Ã‚Â¿Ãƒï¿½Ã‚Â½expressÃƒï¿½Ã‚Â¯Ãƒï¿½Ã‚Â¿Ãƒï¿½Ã‚Â½ and Ãƒï¿½Ã‚Â¯Ãƒï¿½Ã‚Â¿Ãƒï¿½Ã‚Â½tallÃƒï¿½Ã‚Â¯Ãƒï¿½Ã‚Â¿Ãƒï¿½Ã‚Â½ styles with thread sizes to suit most popular models, G1 to 7 Ãƒï¿½Ã¯Â¿Â½Ãƒï¿½Ã‚Â¼Ãƒï¿½Ã‚Â¯Ãƒï¿½Ã‚Â¿Ãƒï¿½Ã‚Â½ gauge. Popular sizes are immediately available, with others to follow. Unique Ãƒï¿½Ã‚Â¯Ãƒï¿½Ã‚Â¿Ãƒï¿½Ã‚Â½soft popÃƒï¿½Ã‚Â¯Ãƒï¿½Ã‚Â¿Ãƒï¿½Ã‚Â½ design developed in collaboration with Gordon Smith. Excellent pressure regulation to meet requirements of accumulation test. Special threads up to 5/8Ãƒï¿½Ã‚Â¯Ãƒï¿½Ã‚Â¿Ãƒï¿½Ã‚Â½ diameter to order. Bronze bodied valves manufactured in our own UK workshop. 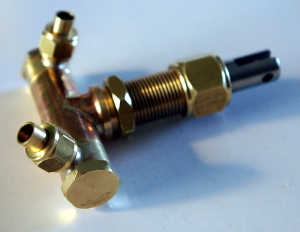 Part of a growing range of high quality steam fittings engineered by: Polly Model Engineering Limited. Polly is pleased to announce the availability of a new loco design by Nick Feast. This is a S.R. Q1 austerity loco, introduced on the Southern in 1942. Nick's design drawings are all in metric and with the simplified valve gear make for a powerful small loco which can be addressed by less experienced model engineers. The design captures the character of the 'Charlie' and Nick's own model has been performing satisfactorily for over two year's on the Bournemouth club track. Drawings are available, castings are being prepared and laser cut parts will also be available. A separated list will be available in due course. Polly Model Engineering Limited is pleased to announce that agreement has been reached with Pete Rich for the exclusive marketing of his designs and parts for his finely detailed models. These designs include the GWR Saint, County, Modified Hall, Castle, Prairie and forthcoming Dean Single and Armstrong 4-4-0 locomotives. The latter two locomotives are to be serialized in the near future in Model Engineer. Tender drawings are available for the Churchward tender and drawings are being prepared for the Dean tender. Though predominantly 5" gauge, Pete Rich has also produced some drawings for 7 Ãƒï¿½Ã¯Â¿Â½Ãƒï¿½Ã‚Â¼" gauge. These include the GWR County 4-4-0 and some tank engines. Please enquire for availability of drawings and parts. Lists will be added to the website in due course. Customers will be aware that the Chancellor has made a temporary change to the UK VAT (Sales Tax), reducing the standard rate from 17.5% to 15% for a limited period. It is our intention to pass the benefits of this onto our customers. We are pleased to announce that there will be a reduction in price of the POLLY loco kits with immediate effect and the reduction will also apply to outstanding kits for existing customers. Please enquire as to how this may affect you. Many of our Stationary Engine Kits will also be reduced in price, as their prices were recently reviewed in the light of very heavy foundry cost increases. The majority of our supplies items are well overdue for price revisions as comparison of our prices with some of our competitors shows. The reduction in the VAT rate will allow us to hold these prices for the immediate future, deferring the inevitable price rises which we may be forced to make in 2009. Customers outside the EU do not pay the VAT (UK sales tax) and their prices can be obtained by dividing the catalog prices by 1.15. A revised catalog will be published in January 2009. The major event of the year, the Midlands Model Engineering Exhibition, takes place at the Fosse 17th - 21st October and there will be plenty to see on the biggest Polly stand yet. We are pleased to advise that the new Koppel tank loco will be there, not just on display but taking its turn on the portable track outside. This new kit build loco is available now, with first kits shipping this month (October). 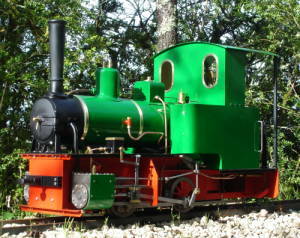 Other Polly locos will also be displayed/running including our popular Polly V tank. The 7 1/4" gauge Collett Goods loco, currently serialised in EIM, will also be on show demonstrating considerable progress since last displayed at Harrogate. With frames and wheels now painted, final assembly of the loco is underway. The 5" gauge Schools loco, featuring in the Model Engineer magazine, is nearing completion and we are pleased to be able to display Derek Tulley's loco. A 5" gauge Churchward tender will also be displayed. This is our prototype model for a finescale GWR tender which can be paired with many popular models. As major suppliers of Stuart Models stationary engine kits, we are pleased to advise that Stuart will also be supporting us at the exhibition and we will have a wide range of their kits available together with the models designed by Anthony Mount and others. All of the above will be supported by our comprehensive Model Engineers Supplies where there are some exciting new products to view, including our new sight feed lubricators. As noted in our catalogue, our supplier is undertaking an extensive program of revision and updating of transfers for miniature locomotives. The following notes summarise the latest releases which are now available: This includes new artwork for the entire LNER range (including GNR), Great Western crests and 1957 late BR lions. All three have been printed in all common sizes including 00, 0, G1, 2½", 3½", 5" and 7¼". The GNR and LNER lettering is now correctly finished in gold, counter-shaded in red and black, with white highlights. As they share a common lettering style, these have been combined so one set of 'GLNER' will either produce 'GNR' or 'LNER', as required. Combining in this way has helped to keep the prices for the greatly improved version down to the same levels as previously. New numerals are also available to match the lettering. The Great Western crests are a completely new introduction and a master piece of screen printer's art. In all sizes from gauge 1 upwards the text under the shields is clearly readable. Likewise, there are mortar courses on the castle and rigging on the ship. This crest can be used with the recently introduced 'GWR' transfers to create G (crest) W, as used on post-war passenger tender engines, or with the 5" gauge 'Great Western' to make up Great (crest) Western, as used on pre-1935 tender engines. Either set of lettering can of course be used on its own for tank or goods engines. 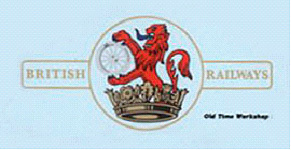 Modellers wishing to finish their locomotives in the later British Railways livery will be pleased to hear that 1957 lions (otherwise known as the 'lion holding wheel' or 'ferret and dartboard') are now available in a revised pattern. 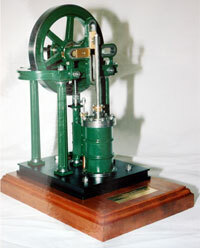 This is without the former green background which caused problems for builders of red or black engines. In all sizes except 57Lion68, they are supplied in sets of three. This is because shortly after introduction, it became BR policy to have all lions facing leftward. Most model engineers wish to have both facing forwards. By having two left-facing and one right-facing lion, both options can be accommodated. Work continues on locomotive lettering for Highland Railway locomotives, and it is hoped that this will be available for the Midlands Exhibition in Leamington. This will consist of names for the entire Loch class, some Castles and small Bens; numbers for buffer beams and cabsides; and the company name and initials for tender tanks. We are pleased to announce the impending availability of a new engine design which Anthony has recently completed. The Cross Engine is somewhat similart to the Rectilinear Engine in operation, but the model is rather more straightforward. Drawings, laser cut parts and castings will be available in the near future and the design is expected to be published in Engineering in Miniature in due course following the completion of the Whitmore and Binyon articles. Polly Model Engineering are pleased to announce a range of high quality precision engineered axle pumps. These pumps available in popular sizes are engineered to high standards will appeal to the more discerning model engineer concerned more with quality than price. A particulary useful feature is the option to adjust the angle to the inlet and outlet pipes facilitating installation. We are now able to supply this difficult to find material in a range of sizes. Ideally suited to finishing tender and tanks. For some time, we have supplied rivet head or slotless metric screws to our tender tank builders. These are now available as stock items in the following sizes: 1.2mm, 1.6mm, 2mm and 3mm shank diameter. The 1.2mm size are a very good match for the 3/64" diameter rivets used extensively in our tenders and if used in preliminary assembly can be retained as they are externally indistinguishable from the rivets. The larger sizes are ideal for the base angle of tenders and tanks or 5" and 7 1/4" gauge locos where both head and nut are visible. Polly Model Engineering Limited is pleased to announce the impending launch of a new loco! Caroline is based on the Orenstein and Koppel 0-4-0T prototype. Although very different in appearance to our other 5" gauge locos, Caroline incorporates proven mechanical parts and boiler from the Polly range. As is our policy, a prototype model loco has been designed, built and steamed before public announcement of this exciting new project which has been undertaken in collaboration with our French distributor Geerlig Voogd. The formal launch of this new model will be at the forthcoming Harrogate exhibition where the prototype model will be on display. Further details will be added to the website in due course. Polly Model Engineering were pleased to support a recent event at the NRM. Cab-It 2008 was staged in order to encourage interest of young people in engineering and it was pleasing to see a good turn-out over the weekend. With displays such as our own interspersed between the historic locomotives, there was ample opportunity to discuss with young people and demonstrate a little of what we do in our hobby. With cabs of famous locos open for inspection and a public lecture on the Saturday evening by Richard Gibbons, a good time was had by all.